The installation workshops are complete. I’ll leave this text here as a record of how we approached the project. Many thanks to all the women who helped us create the books. Prototype of the flag books we'll be making. This one is full of photos from a vacation Jen took. Ours will be filled with images of women making or selling artwork. We want you to help with the creation of the Photo Flag Book Installation that will feature photographs of women making or selling artwork. There are several ways to help. Ask Jennifer to come and photograph you being creative – making art, rehearsing a performance, cooking a meal… whatever you do that is your creative outlet. Email photographs to us to use in the installation. Attend a workshop to help make the books. There’s a form at the bottom of this page where you can tell us how you want to help. This messy workshop is appropriate for all ages; children must be accompanied by adults. The papers we create will become part of the installation. Participants will have time to make a small pamphlet journal to take home. No fee, but pre-registration is required. Maximum enrollment – 12. Because precision folding is required for the construction of the flag books, this workshop is recommended for students age 13 and up. The books we create will become part of the installation. Participants will also make small flag books to take home. Maximum enrollment – 12. 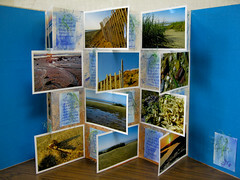 All are welcome to stop by and help finish the flag books by affixing photos and text tags to the flag book pages. This is the day we complete the installation and hang it. Photos taken throughout the project will be available, but participants who have their own 4X6 inch prints can bring them to include in the installation. We will have a photo printer available, so you can bring photos on an SD Card or USB storage device and we can print them. Drop in to observe all or part of the work session or lend a hand. You don’t HAVE to pre-register for this one, but there’s a check box below anyway.